Philly cheesesteaks put to the taste test: Pat’s or Geno’s? | If you’ve ever been to Philadelphia, you may have heard about the business rivalry between Pat’s and Geno’s, two cheesesteak restaurants that sit across from each other in the City of Brotherly Love. TODAY’s Carson Daly gets schooled in the history of the high-steaks competition. We’re back on Today on a Wednesday morning. Not trip to Philadelphia is complete without a cheesesteak. That is right and Carson, you definitely investigate this thoroughly. Guys, it was hard, but someone had to do it. As you know, these past few weeks have been a tale of two parties, but this morning, we give you a tale of two cheesesteaks. Each vying for the taste buds in the City of Brotherly Love. Philadelphia: home of the Liberty Bell, Independence Hall, birthplace of America, and of course, the cheesesteak. It’s not only the city’s signature sandwich, it’s a cultural phenomenon with locals and visitors taking sides in a battle that’s been heating up for nearly 50 years. Pat’s and Geno’s. Less than a football field apart and on the same corner in South Philly. A corner that’s been attracting everyone from celebrities to politicians. Pat’s is the original. The cheesesteak was invented right here 80 years ago. Geno’s, a little late to the game, created their signature steaks in the 60s. GENO: My dad started it in 1966, and he borrowed $200 off my grandfather and turned it into what you see today. Philly may be the City of Brotherly Love, but with bragging rights at stake 24 hours a day, there’s no shortage of healthy competition. I’m going to go see your buddy Frank at Pat’s. Anything you want to say, go ahead. GENO: Frank, I just turned the game up. Now it’s your turn. “Frank, I just talked to your buddy Geno across the street, do you like his cheesesteak? FRANK: I’ve had one of his cheesesteaks before. I was hoping to watch the masters at work, but they put me to work instead. After working up an appetite, I finally got to reap the cheese covered fruits of my labor. It’s a rivalry, but you’re about to see Frank from Pat’s pass his beloved cheesesteak over to Geno himself – this is how parties are supposed to come together. It’s brought a tear to my eye. 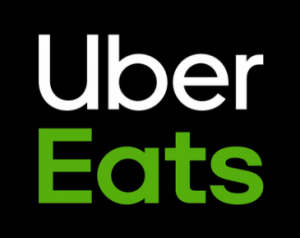 Isn’t the rivalry the greatest thing that’s happened to your restaurants? GENO: Yeah, but there’s really no rivalry. We’re friends. We hang out. We grew up together, and we have two booming businesses. I mean, we actually help out each other. 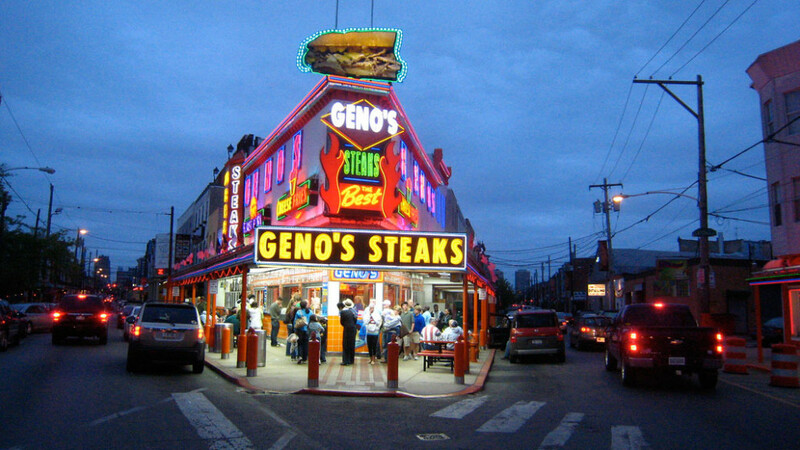 But is it true that if you’re from Philly, you’re either a Pat’s or a Geno’s – never shall the two meet. May I throw in, as an independent, I went to Jim’s yesterday – just saying, it’s a very good cheesesteak as well. But it’s like Heinz and Hunts, right? They are different. The breads come from different places. They cook their meats a little bit differently. Geno is very particular about his rib eyes. They are laid out flat – six or seven going each – very meticulous. And Frank is a little more carefree with it. The onions and the meat are a little more chopped there. You have a little more crisp on your bread, Geno. Yours is just straight kinda soft. There are a little subtleties for the foodies out there. One thing we can all agree on, it’s Geno’s birthday today – happy birthday! Pat got you a sandwich for your birthday. So you have to give us a history of wit and witout. GENO: With W I T H, and without. It’s with and without. But I thought it was ‘wit’? FRANK: He pronounces the ‘T’. I don’t pronounce the ‘T’. Provolone, cheese wiz, American – that’s it. I never have onions with my cheesecake – oh cheesesteak. We love you both. Thank you guys!